Each clip represents approximately 1 minute from first to last shot; streaming compression may reduce this slightly, but a second viewing from memory ought to be very close to real time. 1) This clip of the shooter shows a Parker-Hale Quickloader block fitted to the side of the action of the BSA Martini International Mark II used for the detail, which rifle would be eligible for the Post-Veteran Class. However, the Quickloader keeps only ten rounds available and they are very tightly spaced. The video clip illustrates the advantage gained by using a specially raised ammunition block with a capacity of about twenty rounds - each well spaced. Sixteen rounds are fired in the 60 seconds. It will be heard that the range conducting officer is calling down the time. This is perfectly acceptable within the N.S.R.A. rules (see Time Limit Rules). In fact, it should be observed that the shooter uses the last five seconds countdown to judge that another shot is just possible within the time limit. Not a moment is to be wasted. 2) The second clip shows an excellent count of seventeen shots hitting the target as they are fired. 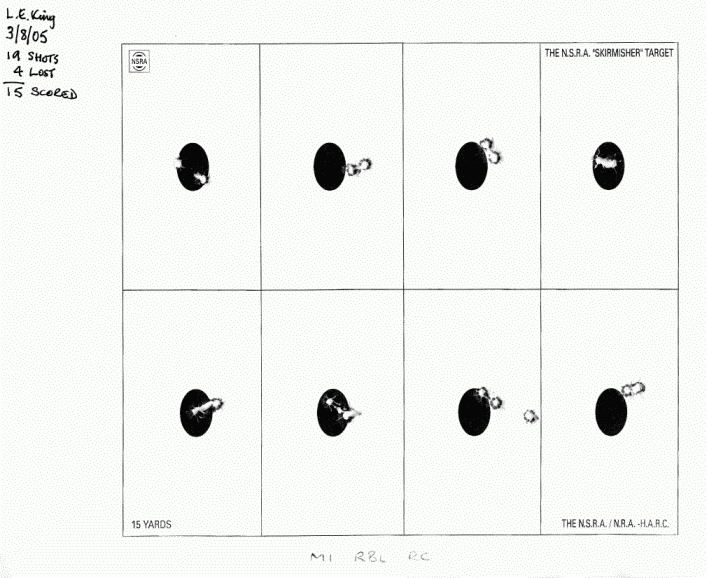 The shooter has elected to fire clockwise around the target, starting top left and initially putting two shots on each of the eight blacks and his seventeenth shot on the last diagram. It is a little difficult to see the hits on the black skirmisher aiming marks, but they are just visible by virtue of a backlit yellow card behind the target.. The scoring is "inward gauging", i.e., the shot only needs to touch the edge of the black to count as a hit. Any shots entirely in the white are points lost. On this occasion, the shooter drops his first shot for a fine finishing score of sixteen. It more usual for the last shot to go astray in the rush to get it away before the 60 seconds are up and "cease" called. 3) The third clip well illustrates how an attempt to fire a greater number of shots - nineteen are fired here in the 60 seconds - can result in a lower score due to an increase in the number of misses. It will be seen that it is still necessary to ensure that two shots are put onto each aiming mark before an attempt is made to fire a third. By firing two shots on each black in turn round the target it is possible to avoid firing three onto one diagram before all the others have two shots ( in this event, the points are lost - the rules disallowing any third shot in any scoring rectangle made without at least two shots being put into ALL the scoring rectangles). The firing of even sixteen shots, with all of them counting, is a significant achievement and requires a great deal of practice. Ten to twelve scoring shots are much more usual, even when attempts are made to fire twenty or more rounds in the minute. The image below is of the card from the third video clip. It clearly shows the "pulled" shots obtained when rushing the trigger pull in an attempt to fire more shots than a sensible compromise needed to retain accuracy. An exceptional result none-the-less; 19 shots fired, 4 lost, 15 scored! However, the target shown in the second video clip has 17 shots fired upon it with only one loss and scoring 16. Quad Erat Demonstrandum! The use by the scorer of a .22 inch plug gauge ascertains that all the above shots, except four, are touching the scoring black. Thus only four shots of the nineteen fired are misses and the total score is 15. It should be noted that ALL of the scoring rectangles contain at least two shots. If any one rectangle contained only one shot, then any third shot in any rectangle would be lost. (See N.S.R.A. Timed-Limit Shooting rules for the Skirmisher discipline).